Shoreham-by-Sea, West Sussex, BN43 5PB, UK. The history of swords is nearly as old as the history of man, who found himself naked and unarmed in a world where all his fellow creatures, although inferior in reasoning powers, were armed with horns, antlers, fangs and claws. In order to survive, man had to use his mental powers to outstrip the animals both in attacking and defensive weapons. Starting with the wooden club and the sharpened stick, both of which survive today in the Drum Major's Mace the Beefeater's Halberd and the lance, the path of development lay through the stone age with its flint axes and arrow heads until the Bronze and Iron Ages, when man first learned to extract copper and tin from ores in the soil and later to extract and purify iron. The word 'Sword' is derived from the old English word 'Sweord' and it is likely that the Dutch word 'Zwaard' and the German 'Schwert' come from the same stem. The Italian 'Spada' and the Spanish 'Espada' undoubtedly come from the Latin 'Spatha'. There were two methods of making the first swords from bronze.They were either cast in a mould or hammered out of a lump of bronze, then ground to final shape on stone. The latter method was preferred as it was found that cast bronze was apt to be brittle, whereas forging had the effect of hardening and tempering the metal. After the sword was made, it was decorated by hand to suit the customer's wishes. The craft of the swordsmith has changed little since these early days. True, the blade is now forged from bar steel by mechanical hammers instead of the Smith's mighty arm, and mechanical stamping and acid etching has partially done away with hand decoration, but the craft is about the only one where the basic methods of manufacture date back to the Bronze Age. The standard service blade commences as a bar of steel 12 inches long by 1 inch wide by 5/inch thick. This is heated and drawn out through mechanical hammers to 24 inches by 3/4 inch by 1/4 inch. It is then reheated and passed through shaped rollers from which it emerges roughly correct in length and shape of the required blade. It is then ground on large stone wheels in the grinding mill to its final correct shape. The blade now passes to the hardening shop where it is hardened, tempered and proved. The final stage is polishing and embossing with the required pattern and insignia. 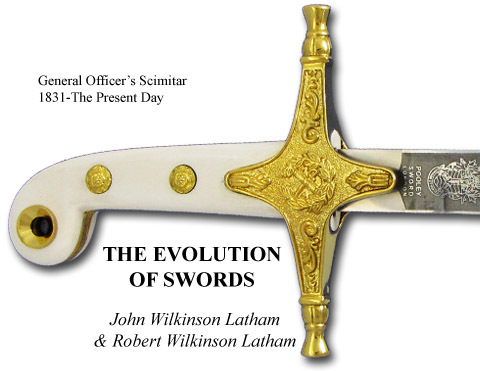 Manufacture of the hilt depends very much on the type of sword being made. The component parts are either cast in gilding metal or stamped out of brass or steel sheet. These parts are then hand finished and chased before passing to the plating shop where they are fine plated with gold, silver, nickel, rhodium or chromium according to the customer's requirements. Scabbards are either of steel, leather, wood covered with leather or velvet. Metal scabbards are formed up by hand on steel mandrels from sheet steel and after brazing the joints, are ground and polished or plated as required. Wooden scabbard bodies are made by skilled cabinet makers to fit the blade of the individual sword, the leather or velvet covering is then sewn on to this body by hand. Leather scabbards are hand sewn over steel mandrels and then oven baked to harden them. 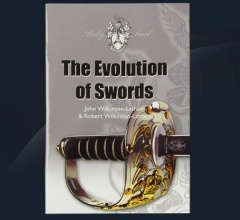 The variety of pattern in swords is perhaps the main feature which has prevented the craft from dying under pressure of more modern methods. 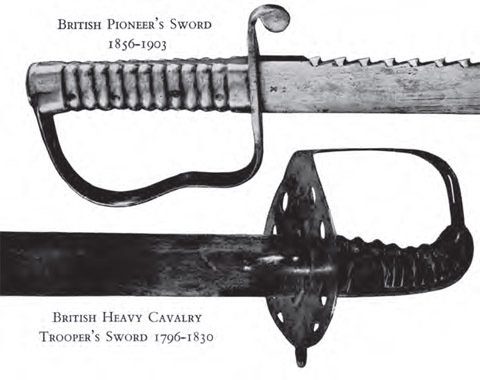 Each and every country has different designs from the others, no two regiments have exactly identical swords, and customers often require special embossing on the blades of their names, ranks etc.